Tanjant’s Gas Adapter Bush is supplied as precise profile fit to torch. Select the Torch Brand/Model from the list, and matching gas adapter bush will be displayed (Part No’s TJ2150 to TJ2199). Click on the Thumbnail Picture to open the full product page. 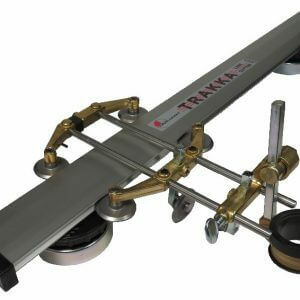 Another option is TJ2180 which is multi-fit by using 3-way screw clamping. 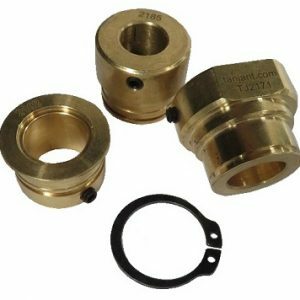 This gas adapter bush fits torch tip nozzle diameters up to 18mm (11/16”) and with 12mm (1/2″) parallel surface below retainer nut. The Adapter Bush is included factory fitted in the Gas Circle Guide, Guide Kit or Trakka product package. However use selection process where a bush is required. This may be to complete TJ3085 Bevel Attachment, or a spare part, or to enable another make/model of Gas Cutting Torch to be fitted. The circlip (snap ring) and fastener(s) are included in the Adapter Bush pack. Tanjant’s solid brass Adapter Bush is CNC machined for precision fit and long service life, in even the harshest conditions. Bushing is laser-engraved with Part Number for identification.